As a nest is created from bits and pieces of everyday things - so is this blog. Welcome to my nest! I am going to try a new thing on my blog. It seems like throughout the week I collect things to blog about but I never am able to find the time to devote to each little topic. So now on Friday's I am going to do a post and mention everything that I collect during the week. Warning - this week may be kind of long (smile). This past week we celebrated my mom's 70th birthday. She sure doesn't seem 70 to me. She can still work circles around me. She loves projects of any kind and all of us girls appreciate all the help she gives us from babysitting, dog-sitting, painting rooms, refinishing wood floors - you name it and she loves to help! 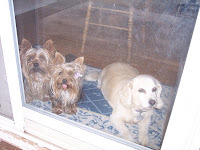 She is in the center of the picture on the left. She looks so young - you probably can't pick her out! 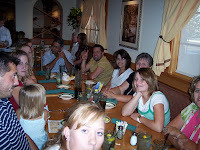 Our family took her to the Olive Garden to celebrate. There were 23 of us! 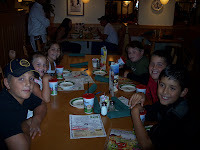 We put 8 of the kids at a table across the room by themselves - it was the best the staff could do to accomodate us. We were a bit nervous about it - these kids can be rambunctios - but they were perfect little angels. I guess they felt all important being off by themselves in a big restaurant. They did get a lot of funny looks from customers who walked by wondering how they got there and why they were alone. I also found this adorable pattern for Quiet Books that I am going to make for two special little 3 year olds in my life. My mom used to make these when my sisters were babies and I loved them then. This pattern looks a little simpler and I can't wait to start. I have also found a great idea for a gift to make for each of my daughters. Sorry girls, I know you are reading this - it's Top Secret! But you're going to like it. And it is very practical. And very pretty. And I can't wait to see how much you are going to like them - and that's all I have to say about that! Becky is first - she is just the sweetest person. She calls me a kindred spirit and I like that. It makes me feel like Diana to Anne Shirley. 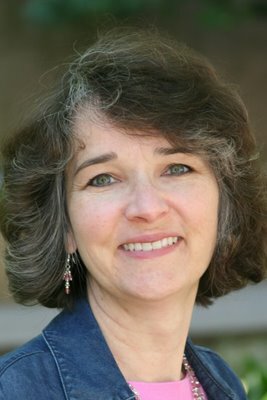 Becky is a fellow pastor's wife, she is a retired teacher, a mom to three boys and she has her own Butler! I love Becky's practicality and her personality. I'm pretty sure if we ever get to meet in person we will be instant sister chicks! Corrie at One Gal's Life in the Raw is a young mom whom I really admire. I love her outlook on life and she is just the kind of mom I hope my girls are someday. And then finally, I want to introduce you all to a new blogger whom I think is just awesome. She is a stay at home mom to four kids and she babysits so she can continue to stay at home. You never know how many little ones are going to be at her house. She is a great mom, her house is always clean, her laundry is most always done and she is just a great person. Oh, and did I mention that she is my sister! Everyone welcome Mindy from Mindy's Life! 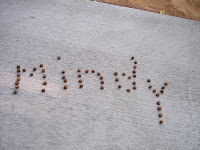 Here Mindy- here is your name all done up fancy like in dog food! And finally I wanted to say a big thank-you to Laura from Laura William's Musings for bestowing this lovely award on me. I can't think of any award I would be more proud to have. Being nice isn't always the most natural or the easiest thing to be. I have to work at it. I suspect we all do sometimes. I can't possible limit this award to only7 others. Sorry, can't do it. I haven't run across anyone not nice in this little blog land we have. I think you are all nice! I hope you all have a wonderful weekend. I'm spending some time with my husband and am going to try to lay a bit low. It's been such a busy summer and I just long to stay home and get rejuvinated! OH! You are so right. I have not run into a not-nice blogger either. What a great way to put it into words. So NICE of you :) Well deserved and congratulations. You are hilarious with the dog food. That was perfect! And I giggled at the part about you playing with their lunch and how they would gobble up our names. And thank you so much for the nice things you said. You're a dear! What a great post. And doing a Friday wrap up is the best idea. I have one blogging friend that posts when she can, but she can really do a wonderful one on Sundays, when she wraps up her week, gives us a devotional, has a favorite picture of the week, quote of the week (comment), etc. I wait anxiously for her Sunday posts every week. Lately ... they have come on Monday. She's busy too. Good to catch up with you Robin. Have a wonderful weekend, and thanks for playing along on the name game. Love that you used dogfood! I think my hubby would have thought I was crazy if he saw me doing that! LOL! Very creative! That is TOOOOO funny. No popcorn before microwaves!!! I love it! Good to hear from you this Sunday morning. I'll let all know how the Butler's trip goes. Thanks for praying with me. Have a great week, Robin. I tried to divert his attention with your puppies...but he wanted to "get them". The birthday celebration looked like a blast! 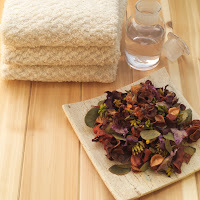 I like the idea of a potpourri Friday! I absolutely love the bloggity friends I have met. I cannot get over the goodness of the Lord to me sometimes. Robin, I know that yearning, believe me. That is why I refer to you as my kindred spirit. I am praying for your perseverance sister! Glad your mom's birthday went well. How fun! 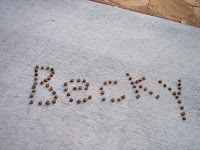 I have never been more honored to have my name spelled out in dog food before!!! 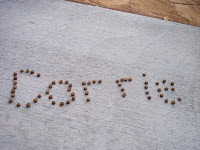 Okay, I've never really had my name spelled out in dog food before...I can't wait to do this meme. Stay tuned to see your name soon! Have a great day, Robin. I am thankful for your friendship! 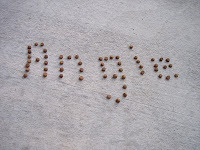 I love your dog food names, cute! There are so many nice bloggers out here, glad I found yours too! 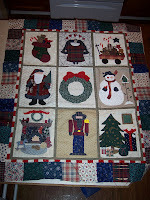 You and Becky are so smart doing all this quilting, I so need to learn how....and I love the little books. Is that a simplicity pattern? I've got a few little ones I might could do that for but I would definitely need a pattern. I'm behind on all my sewing right now but need to get on it again. Thank you so much for your sweet comment on my post today. I didn't have your e-mail address to reply to the comment you left....But I have been there---in that painful place of mothering. I would love to share more w/you and how the Lord brought me through---up to this point that is :)---He still carries me! Like you, there are some things I can't post on my blog. But God is good...through all of it. He hears our prayers and I will not give up praying for my prodigal child---and her husband...and all the prodigals in our life! Be blessed---you are such an encouragement to me! Thank you for all your prayers and sweetness!